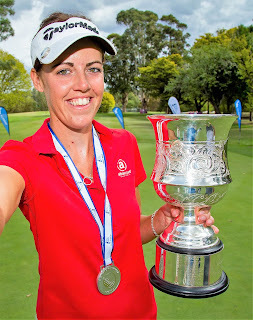 Queanbeyan, Australia - March 10, 2019: England’s Meghan MacLaren has won the Women’s New South Wales Open presented by Worrells for the second successive year after an impressive final round of two-under-par 69 for a three-stroke victory at Queanbeyan Golf Club. MacLaren was the only player in the field to shoot four rounds under par and finished on a total of 12-under-par 272, three ahead of New Zealand’s Munchin Keh and Swede Lynn Carlsson. Tied for the lead with Carlsson entering the last day, MacLaren twice lost her lead during the final round and it was a tense finish, but the 24-year-old from Rushden, Northamptonshire, finished eagle, par, birdie, under intense pressure to close out her second Ladies European Tour title in 30C temperatures at Queanbeyan. Whereas MacLaren saved her best until last, unfortunately Keh saved her worst. Six-under-par for the day and in possession of a two-stroke lead after making her own eagle on the 16th, the diminutive 26-year-old collapsed with a double-bogey 6 on the last hole to hand MacLaren a two-stroke advantage. Keh, who had not made a bogey all day, hit her tee shot well to the right on 18 and tried to play a punch cut under the tree, but the Aucklander ended up hitting the trunk and her ball ricocheted onto the adjacent eighth hole, from where she chipped back onto the 18th fairway, played her next shot onto the green and then missed an eight footer for bogey. MacLaren, who held a one-stroke lead after going to the turn in level par with two bogeys and two birdies on her front nine, had lost her advantage after finding trouble in the trees on 13, but she conjured a piece of magic on the par-5 16th hole. Knowing that she was two behind, she played a brave 3-wood shot over the trees from 206-yards to the pin and rolled in an eagle putt from six feet to draw level. After making a par on 17, she then played a perfect 8-iron shot to the heart of the 18th green and rolled in a 12 foot putt for birdie. “I wish I could play all of my golf in New South Wales,” said MacLaren, who won the title by two at Coffs Harbour last year. “It’s a bit of a weird one, because it’s not at the same course, so it almost doesn’t feel like the same tournament. It must be something about Australia and coming to the end of the whole trip. “It was pretty gritty out there for a long time and quite nerve wracking. As much as you want it to be like the last few days and all controlled and straight f orward, it just wasn’t like that. I had to hang in there and even though I dropped a couple of shots, I knew that things were going to be close and nobody was running away with it and I just hoped for a moment of magic somewhere and it happened. “It’s funny, I had almost the same shot yesterday where I had to hit a 30, 40 yard cut with a 3-wood around the trees and I pulled it off yesterday, so I thought, ‘I know I’ve done it; I know I need something.’ I knew the lead had gone to 11-under at that point, so I was chasing and as soon as I hit it, I hoped that it would be right and it was. “Last year was my first win and that was a big deal and I don’t think anything can compare to that. You don’t want to be a one-win wonder. There was a bit more pressure this week, so to come through that feels amazing. After lifting the trophy, MacLaren heads to Cape Town for the next LET tournament: the Investec Women’s South African Open, which gets under way at Westlake Golf Club from Thursday.